The Painted Buntings (Passerina ciris) are small, brightly colored members of the Cardinal family. 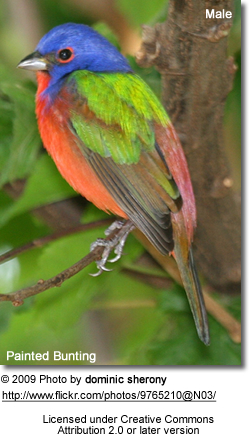 They are also known as Painted Finches or Rainbow Buntings. Their common names were inspired by the brilliant plumage details of the males. 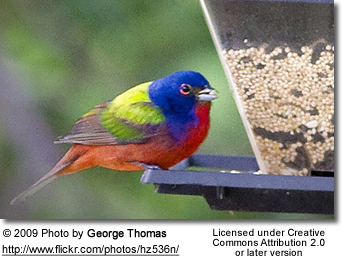 Many consider the male Painted Bunting to be the most beautiful bird in North America, and they are amongst the most popular visitors of bird feeders. As a result of their dazzling looks, in combination with their lovely warbled song, these birds are in demand as cage birds. Due to a combination of habitat destruction and capturing for the pet trade, their numbers have declined since the mid 1960's. This species is now listed as Near Threatened by the IUCN and they are now under the protection of the U.S. Migratory Bird Act, which makes it illegal for anyone to disturb their nests and eggs; or in any way harm, capture, sell or own juveniles or adults. However, in the Caribbean, Mexico and Central America, these birds are still trapped and illegally sold. 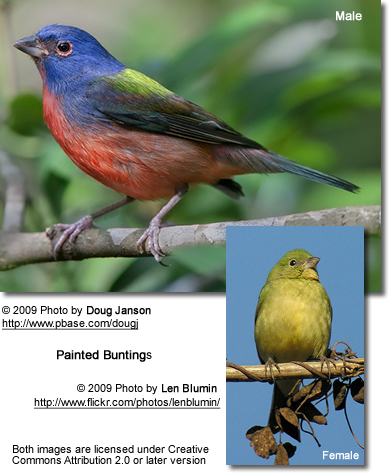 Painted Buntings are short to medium-distant migrants. They travel north to their breeding territories in early April to mid-May and return to their wintering grounds from end of July to mid- October. They breed in southern Arizona, southern New Mexico, southern and eastern Texas, Oklahoma, Arkansas, Louisiana, coastal Georgia, southern coast of South Carolina, northern Florida, and northern Mexico. Vagrants have been reported as far north as New York, Pennsylvania and New Jersey. They migrate south for the winter, specifically to South Florida, the Bahamas and Cuba and other Caribbean islands; as well as overwintering along both coasts of Mexico and throughout most of Central America (down to Panama). These shy birds favor habitats with thick cover along forest edges or other areas with dense under story, typically close to streams or other bodies of water. They typically feed on the ground under shrubs and trees. Males have a reputation for being very aggressive and territorial. They may even go as far as kill intruding birds. Range: Coastal southeastern United States - from the coastal regions of North Carolina south through Georgia and Florida, east and south to Bahamas, Cuba, Jamaica and Yucatán in Mexico. Eastern birds tend to molt before migration to their breeding grounds in southern Florida (including the Florida Keys), the Bahamas and Caribbean islands. Range: Arizona east and north to Kansas, south to Louisiana and Texas, northern Mexico to western Panama in Central America. Western birds molt in mid-migration in staging areas in southern Arizona and northern Mexico, then continue to migrate further south to their wintering grounds in Mexico and Central America. Comparative size: Somewhat smaller than Bluebirds, and larger than the American Goldfinch. Male: Deep blue head, red eye rings, bright green back, red chest, red or orangey belly, dark wings and grey tail. Female: Greenish above and buff below. Olive wash on the wings. Pale eye rings. Thick, cone-shaped, bill that is dark brown to blackish in color. The lower bill is slightly thicker. Dark dusky-brown feet and legs. Throughout most of the year, Painted Buntings mostly feed on grass seeds. They will also visit garden feeders. However, during the breeding season, they require a diet rich in protein to support the rapid growth of their chicks and they switch to a diet that most consists of insects, such as grasshoppers, weevils and other beetles, flies and wasps; as well as taking caterpillars, spiders and snails. They will also steal insect prey from spider webs. The breeding season stretches from late April through to early August. Most nesting activities are observed from mid-May through to mid-July. Pairs are seasonally monogamous, except for a few instances of polygyny (males servicing several females). Males typically arrive at the breeding grounds about a week before the females and establish small breeding territories. Once the females arrive, males will perform courtship displays to attract females. Once a good match has been found, the pair will seek through low, dense vegetation to identify a suitable nest site. They usually choose a spot about 3 - 6 feet (about 1 - 2 meters) off the ground. On rare occasion, they have nested as high up as 50 feet (~15 meters) off the ground, in areas that lacked low vegetation. The female alone constructs the cup nest in as little as two days using weed stems, Spanish moss, grasses, rootlets and bark strips, twigs from mulberry, mesquite, elm, Osage-orange (Maclura pomifera), greenbrier, oak, myrtle and pine trees. They may also take other items found in their environment, such as rag scraps or pieces of tissue paper. The nest is bound with cobwebs to strengthen the structure and firmly attached to a supporting plant. The inner cup measures about 2 inches (5 cm) in width and is about 1.5 inches (3.8 cm) deep. The nest is lined with soft down and mammal hair. A clutch consists of 3 to 5 greyish-white eggs (average being 4) that are sometimes spotted with brown or grey. Each egg measures about 0.7 inches (1.8 cm) in length and 0.6 inches (1.4 cm) in width. The female incubates the eggs for about 10 - 12 days to hatching. The hatchlings are helpless and except for some light down are naked. They weigh less than a tenth of an ounce (less than 3 grams). The female raised the young alone for the most part. The male may occasionally help with feeding. The nestlings fledge when they are about 12 - 14 days old, and the female often starts on a second clutch about 30 days after the first chicks hatched. Pairs may produce 1 - 3 broods per year - depending on availability of food and nesting conditions. Their calls include high pitched warbling, chirps and chips. 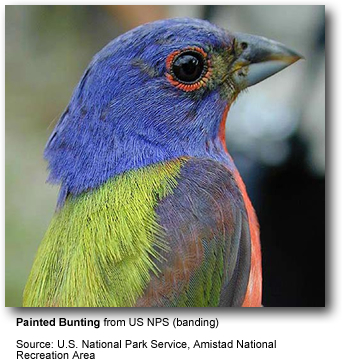 The oldest recorded Painted Bunting was at least 11 years and 10 months old when it was caught in Texas and subsequently released by a bird bander in 2011.